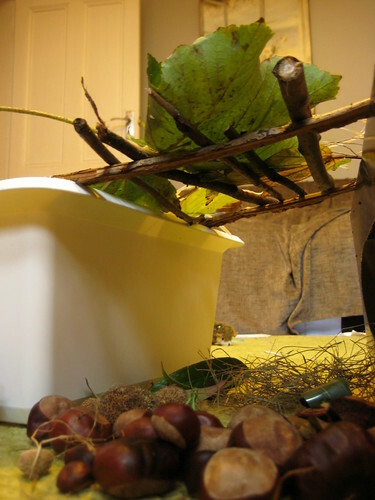 How to make an easy autumn sensory tub with natural materials. 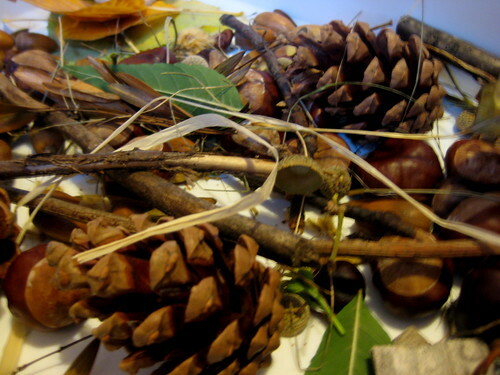 Using all the materials we gathered in our treasure bags on our autumn scavenger hunt, today we made a sensory tub. 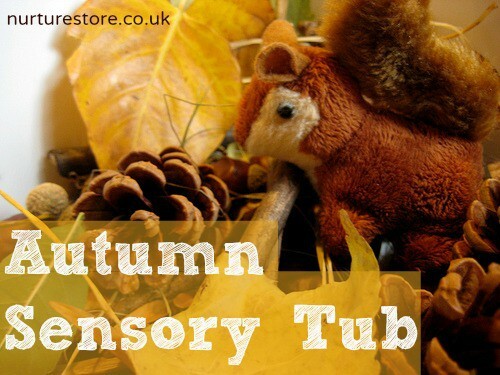 Sensory tubs are wonderful for young children to play with and at this time of year Mother Nature provides lots of ingredients to use which invite children to explore colours, textures and sounds. 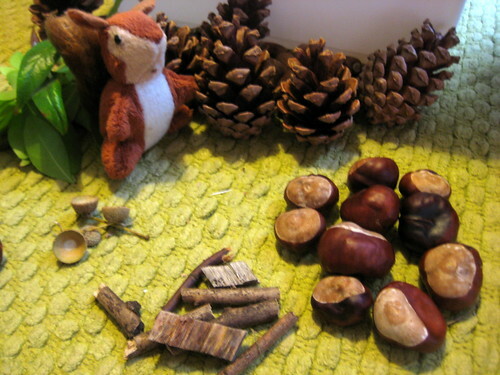 We filled our tub with dry crisp leaves, sticks, acorns, conkers, fircones, seeds. We invited some squirrels to come along and play. The children soon had the animals chatting to each other and building nests. 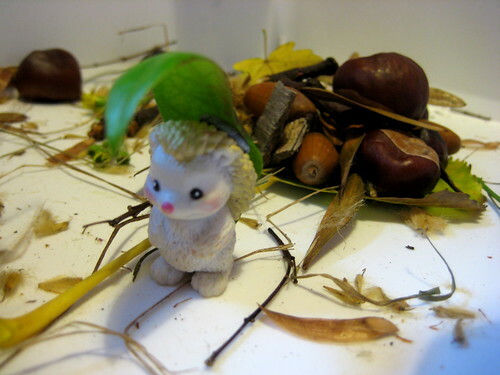 I told them I’d hidden twenty acorns in the tub and asked the squirrels if they could find them all. And look how hard this hedgehog is toiling to bring its leaf wheelbarrow of goodies home to its family – with a leaf umbrella to shelter help from the rain. I think we’re going hiking next week to look for nature items. I’m pretty sure I’ll be able to find acorns this time of year but California is so behind when it comes to fall. Most of the time fall doesn’t really hit until late November! It’s a bit frustrating! Rachele, It’s drab and grey here today, so I wouldn’t mind a bit of Cali weather. Love this! Why buy toys when you can find them right in your own backyard! Wow, that is brilliant! so cute! 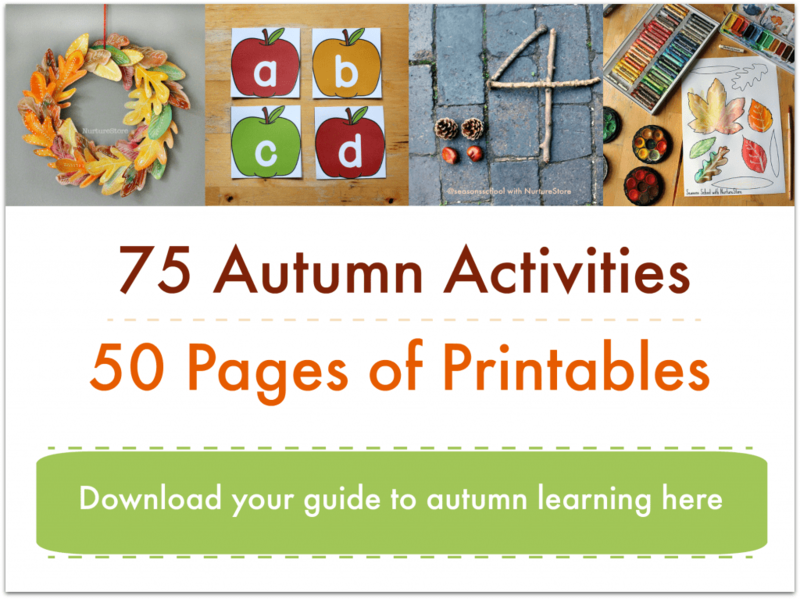 Thanks for linking up to Fun Sparks. It appears that you have some buckeyes or horse chestnuts. Includes are poisonous. I don’t know about horse chestnuts.